How much water does my grass need? Landscaping design companies like us install and maintain a lot of grass every season. We sod, we seed, we cut, we weed. New lawns look great – green, lush, and weed-free. But often, maintaining a healthy lawn can be trying, and one of the biggest challenges is typically adequate watering. With heightened environmental awareness these days, homeowners tend not to be heavy-handed with watering, but many overestimate the amount of water it actually takes to keep your lawn green. Below, we’ll break down watering needs for new sod, seeded yards, and established lawns. For best results, water each area daily for 1 ½ – 2 hours. The second week, reduce watering to every other day, for the same length of time. Note: Do not cut sod for at least 2 weeks after it is installed. When you first cut it, raise blade to highest position. Wait at least 3 days to cut again, this time with the blade in second-highest position. This will ensure the vaccum-like suction of the lawn mower doesn’t lift the sod before it is fully established. After another 4 days you can cut using your usual blade position. A newly seeded lawn requires brief watering – only 15 minutes per area – twice daily until seed has germinated. The goal is to keep the soil moist but not oversaturated, so avoid having run-off or standing water. Once seed has germinated, reduce watering to every other day, for the same length of time. If at any point, you get rainfall while seed is getting established, you can forego watering for the day and resume next day. Note: Wait until the grass is at least four (4) inches high before cutting for the first time. Raise blade to highest position for the first cut. Wait at least 3 days to cut again, this time with the blade in second-highest position. This will ensure the vaccum-like suction of the lawn mower doesn’t lift the seed before it is fully established. After another 4 days you can cut using your usual blade position. If you’re going to water, water regularly. If not, let your grass go dormant. Anywhere in between is not healthy for your grass as irregular watering can put stress on your lawn’s root system. Water in the morning. The air is generally cooler and the water has just enough time to soak into the ground before the day heats up. Afternoon watering leads to evaporation, which means the water doesn’t get where it’s supposed to go, and watering in the evening generally can make grass more susceptible to fungus growth as the water sits on the blades of grass for too long. Water just long enough for the water to soak about 2 inches (5 cm) into the ground. This will take about 2 hours of watering per area. If you do that twice a week during dry spells you should be able to keep your lawn green and healthy, while avoiding overwatering. 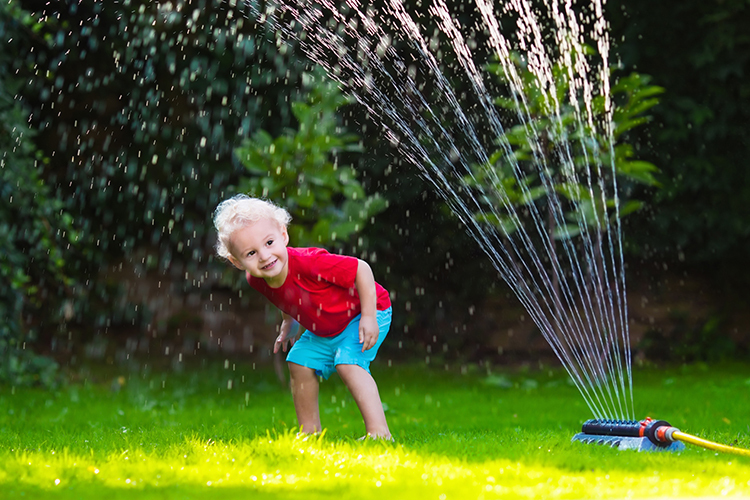 Many people set up a sprinkler, intending to move it or turn it off after 10 or 15 minutes, but then get preoccupied with something else, resulting in overwatering. Consider using a hose timer to avoid over-watering. A decent one will only set you back $15-$40 and can be found at most hardware stores and major gardening centres. Following these guidelines will help you maintain a healthy, green lawn from Spring to Fall. Of course, if you have any questions, we’re just a phone call away.